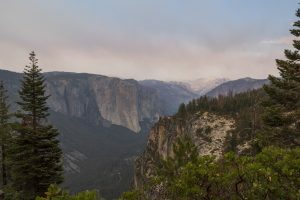 The Pohono Trail travels along the south rim with many points overlooking Yosemite Valley on this long, one-way trip from Glacier Point to the Wawona Tunnel. 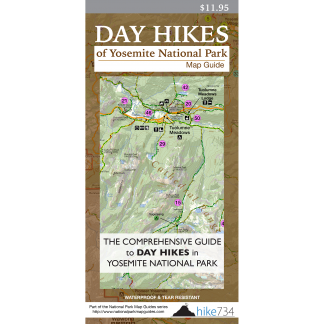 After exploring the popular and busy Glacier Point and its incredible views, find the signed Pohono Trail to the southeast. Continue on the Pohono Trail, to additional impressive views at Taft Point (see Sentinel Dome/Taft Point Loop). After Taft Point, the trail leaves the rim and goes gently up and down through a wonderful forest, and passes Bridalveil Creek and the McGurk Meadow Trail. The trees thin out as you approach Dewey Point where the valley, once again, explodes into view. You’ll encounter similar, incredible vantages at Crocker Point and Stanford Point as you continue your way down (see Stanford Point). Beyond Stanford Point, the trail enters the forest and descends through the trees with no real views until you come to an old road at Inspiration Point. Yosemite Valley is fantastically framed from this vantage. The last drop down to the parking lot mixes forest with open views as it switchbacks to the road (see Inspiration Point). Trailhead: No official shuttle connects Glacier Point with the Wawona Tunnel. Arrangements will need to be made with two vehicles or a shuttle from a friend.